This past weekend, I saw Dinesh D’Souza’s 2016: Obama’s America. It was playing on some 1,000 movie screens. And this upcoming weekend, it will open up on a thousand more. There’s been considerable coverage now that it’s broken into the weekly box office top ten. Not only that, it’s at least the fifth highest grossing political documentary of all time. Watch out, Michael Moore! I have offered some critical words about D’Souza’s past work. Just the cover of his 2011 tome, The Roots of Obama’s Rage, comes off as a psychoanalytical potshot. But given the election year excitement and buzz, I thought I’d give 2016 a try. The film is well-produced, and acclaimed Hollywood veteran Gerald Molen can be thanked for that. The music, not overbearing or manipulative as we might expect for a political documentary, lends an air of excitement and intrigue befitting the cosmopolitan journey. After all, this is D’Souza’s “reading” (as my wife put it) of Obama’s globetrotting, cross-cultural upbringing. D’Souza lays out a comprehensive case in the course of 90 minutes; undoubtedly, he has done his homework. Polished graphics and dramatic cuts of D’Souza retracing Obama’s footsteps through Indonesia, Hawaii, and Kenya add grit and a kinetic potency to his “anticolonial” thesis. A recent AP Fact Check–which Breitbart’s Big Journalism has answered–takes exception to some of D’Souza’s claims. But the finer points of what Obama was exposed to at prep school or what his father’s old associates believe about Israel pale in comparison to the the core fact that the AP fact checker perhaps willfully overlooked. This is the odd trajectory his white, American, maternal side of the family put him on. Looking beyond the film for a moment, we can see the root of that strange trajectory. President Obama’s maternal grandfather, Stanley Dunham, named his daughter after himself. Of course, people mostly know her by her middle name Ann. Back in the film, we see Ann’s radical values–adopted early in life–play out. She rejects her Indonesian husband Lo Lo Soetoro because he cozies up to an American oil company and comes to oppose communists. This telling is hardly the kind of “logical stretch” that AP’s fact check would have you believe the film is built on. D’Souza’s most important revelation may be Obama’s “founding fathers.” How he comes to know one of these guiding lights is particularly telling. Young Barack’s grandfather Stanley Dunham introduces a peculiar personal friend to be his mentor: card-carrying Communist (no. 47544) Frank Marshall Davis. At one point in the film, D’Souza refers to Obama’s ideas as “alien.” As cringe-inducing as this may sound, it is not a prelude to a radical right rant. Neither is it a racist code or dog whistle. After all, D’Souza is a mixed race immigrant from the global South. That Barack Obama is black is merely an asterisk to the long-raging ideological struggle that lent his mother and grandfather strange ideas most Americans reject. 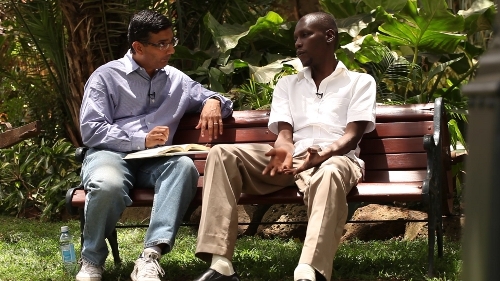 As important as D’Souza’s revelations are, we’ll find in 2016 a deeper significance. It’s a film where a South Asian immigrant stars in a winsome, provocative telling of his own life as it contrasts with Obama’s. During one prominent segment, D’Souza invokes the expert testimony of a fellow biracial academic, Shelby Steele. Liberal Hollywood doesn’t hand us such a substantive, diversely-cast film everyday. Sure, there’s Harold and Kumar, if Asian-Americans being depicted as stoners is somehow a good thing. What 2016 accomplishes by featuring such thought-provoking minority conservatives is something neither the media, academia, nor the rest of our liberal cultural elites can stand. This film is a very “brown” critique of the liberal worldview, and something I deeply appreciate as the son of a Southeast Asian immigrant myself. Just as D’Souza relates his own college experience to spotlight the strange thinking of some Americans, I can recall absurd liberal expectations that I encountered as a college student of color. Minority conservatives are to be found not just on screen, but on stage, at the Republican National Convention. Speakers like Nikki Haley, Artur Davis, Condoleezza Rice and Susana Martinez have this year voiced their rejection of liberalism while affirming all that makes America powerful, decent, and good. Nothing threatens the liberal worldview more than when its objects of sympathy and concern stand up, call it for what it is, and reject it. As important as it will be in getting out the 2012 conservative vote, 2016 is, perhaps more significantly, another nail in the coffin of liberal ideas whose time has passed.